This time my ride on the train was different– I paid attention! The last time I rode the train into the big city, I found myself sitting all alone on a silent, motionless train with the next stop indicator flashing “OUT OF SERVICE!” Not one passenger warned me about reaching the end of the line. I jumped out of my seat wondering, “Where am I? How long have I been here?” I was so insistent on using my time wisely on the 40-minute ride, that I lost myself in writing an article on my phone. Yes, this time my ride on the train was different. I noticed the man whose beard was long enough to touch the pages of his book. I noticed the cat poster on the window reminding me how much I love dogs. I noticed the woman who refused take an open seat despite her unsteadied efforts to free herself from her earbud cord. I was very observant, maybe even vigilant. Failing to See? Blind spots are tricky. Sometimes we are fortunate enough to have colleagues willing to share our, um… opportunities. If you unaware of at least one blind spot, it’s time to seek feedback from those you trust. Believe me, others have ideas about your blind spot(s)! Leaders create an environment where it is safe to learn! Needing to Research? The scarcity of information is not justification for indecision. The “unknown” is challenging enough for team members without the added frustration of a uniformed or misinformed leader. Pursuing answers to the tougher questions establishes trust and engagement. Leaders create an environment where solutions are implemented. Intentionally Avoiding? Most teams or organizations are ready for a culture shift, technology upgrade, or staff restructure. Each passing day presents another reason for making improvements. Though delays seem inconsequential, the train keeps travelling from stop to stop. Team members are either getting onboard or disembarking. Leaders create an environment where improvement is constant! On my last train ride, I ignored no fewer than 11 stops and was completely unaware of my surroundings. Yet, each stop offered multiple indicators: a verbal reminder about the current and upcoming stop, flashing bars of light, and a bell that could be heard by everyone (including the woman listening to tangled earbuds). I challenge you to be intensely attentive, unambiguously knowledgeable, and powerfully courageous about the needs of your team and organization. Leaders create an environment where indicators are observed and addressed! The post End of the Line appeared first on Leading Synergies, LLC. 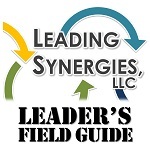 Synergy Group 2019-Q1 Session is coming!